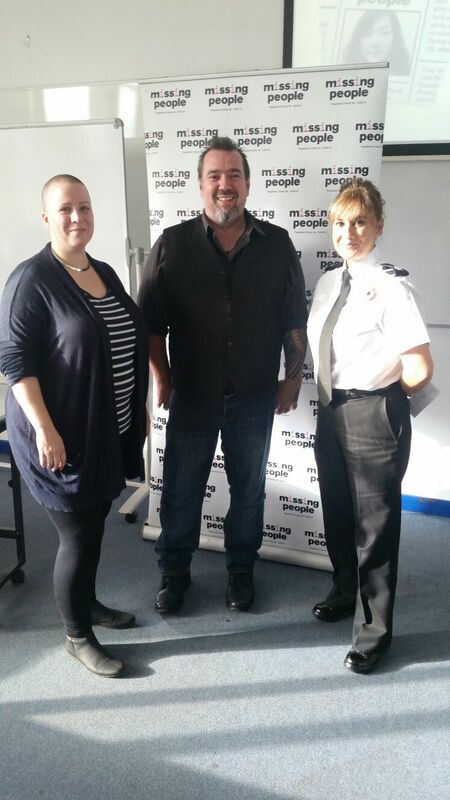 This week we rounded off our series of four launches of Aftercare at police forces across Wales. We were honoured to launch Aftercare to staff at North Wales Police in Wrexham - here are Detective Superintendent Jo Ramessur-Williams' thoughts on the new service. "People that have run away will often have done so because they have reached a point in their lives where they are no longer able to cope, they need help or at least signposting to help. Finding the missing person is only half the story and it only means that we know where that person physically is. It could be that all we have achieved is to temporarily reduce the risk. It's important that when the missing person is found, or when they return home, there is a skilled and readily available support mechanism there for them if they need it. The family and friends of the person that is missing will also be going through a challenging time. Worried for their loved one, not knowing what has happened to them or where they are, concerned that something awful may have happened to them. They need support whilst the person is missing but equally importantly, they will need help and support when the missing person returns or they regrettably receive bad news. The family may be struggling to understand how to support the person that was away; they might feel guilty for not spotting signs earlier; they may feel angry about what happened. Especially difficult for families are those missing person cases where their loved one is not found for a long time or in some cases never found. These families need long term support sometimes over many years. Perhaps offering legal advice or, in worst case scenarios, helping them at an inquest. As Head of the Protection of Vulnerable Peoples Unit for North Wales Police I am acutely aware of the impact on individuals and families when loved ones go missing. Some may not even realise or recognise that they need that help. Simply finding a missing person is not a magic wand to fixing what they ran away from in the first place. The original problem is highly likely to still be there, and without help, the person may simply find them self quickly back on the brink again. This support mechanism needs to be complimentary to existing processes within organisations, and one that understands the issues, knows how to tap into resources and organisations that can help and which is able to offer advice and help within a confidential environment. Again they need to know that there is support out there for them that will assist them in a non-judgemental way, showing empathy and helping them to pick up the pieces. As police, we often deal with cases whereby the missing person is found and they are safe and well but they refuse to allow us to tell their families where they are. As adults, they are of course entitled to do this but this can be very difficult for families to understand and cope with. Missing People have the experience and now the mechanism to help guide and support families in these circumstances. The launch of Aftercare will enhance our already existing partnership with Missing People and I am sincerely delighted that the people of North Wales will be able to benefit from this service – a service which can be accessed by those who need it at a time when they are need it the most. This type of complementary service already exists for children within North Wales as North Wales Police work in partnership with Barnardo's, who carry out return home interviews for those children who are at most risk. Aftercare, which is free of charge and is available for adults, young people and family members who have been affected by someone being missing, will strengthen the existing processes we have in North Wales. Just to be clear about the value that Aftercare will bring, a return interview - which is what Police will carry out following a missing episode -is a short term arrangement which asks questions regarding the missing episode, focusing on why the individual left, what happened whilst they were away and how they are feeling now they are back. Aftercare will provide continued support to the issues the individual is facing on their return.This may include the development of a care plan made with the individual to suit the needs of that individual together with support whilst signposting the individual or family to the correct organization. By taking this holistic approach, it is hoped that this will help to pre-empt and prevent further missing episodes and the first steps of their journey to address the issues which caused the individual to go missing in the first instance will have started. I am delighted to be part of the launch and I wholeheartedly support the development of Aftercare in North Wales.